Online round 1 was done on three dates again this year. The first (1A) fell in the middle of the night so I skipped it. I attempted the second, 1B, but I was distracted by important household chores. That's also why I didn't make any sketches. The first problem was easy enough, and I found a solution while fixing a meal for a kid who'd just returned from boy scout camp. The basic idea is that the horses all queue up behind the slowest one, so the arrival time is the latest arrival time at the destination point for all horses. The solution (A.lisp) worked fine on the first attempt of the small dataset, and also on the large one. The large dataset, where the unicorn's mane can have mixed colors, looked significantly more complex than the small one, where there are only three colors. 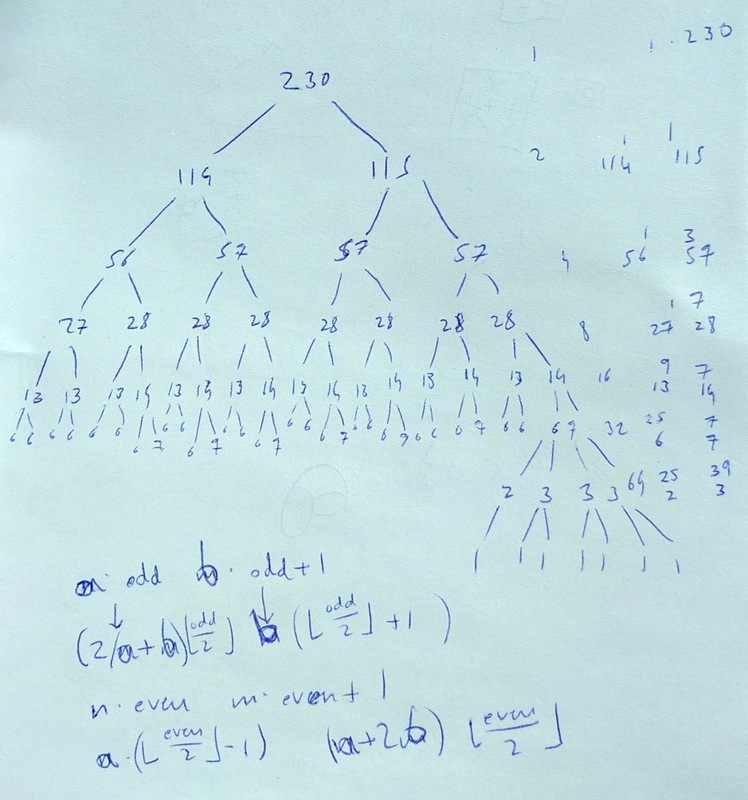 I attempted a straightforward greedy algorithm, but somehow got it wrong. Because I didn't feel in a good state of mind, I decided to give up at that point. Otherwise I would have attempted the small dataset of Problem C: Pony Express. The "large dataset" cases of both problem B and problem C looked just too difficult to me. A quick analysis suggested to me that the radius of the pancakes isn't relevant, because only the bottom (largest) one "counts", so I need to pick the pancakes with the largest lateral surface. Of course that reasoning was wrong, because we also need to pick which will be the bottom pancake. This error cost me two bad attempts, but I managed to reuse most of the initial code by adding a loop around it that tries various base pancakes. The code is in A.lisp and, again, worked fine for both the small and the large dataset. The optimization problem looked a bit tricky (but doable) in the general case, but the "small dataset" case was very specialized and easy enough to attack. There are only 1 or 2 activities in total. Either each partner has one, or one partner has all 1 or 2. If each partner has one, then the optimal solution always involves two exchanges. 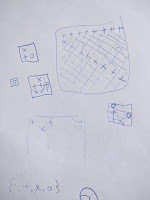 If one partner has the only one activity, the solution is even more trivially two exchanges. If one partner has (all) two activities, then the optimal solution is two if those activities can be arranged on the same "half-circle" (12 hours or 720 minutes) of the day, otherwise four. I coded these cases in B.lisp and was successful on the small dataset. In hindsight I'm surprised that it took me so long, more than 45 minutes between my submissions for A and for B-small. In particular, I thought that the training budget should always be spent on the worst (lowest-p) cores first. So I wrote this trivial loop, ahem, recursion, that spends as much as possible on those worst cores until either the budget is used up, or the worst cores become improved enough to be as good as the next-better core, or the cores reach p=1. But all my attempts were rejected, and embarrassingly I still don't know why. Probably my reasoning was again oversimplified. Or it was something about the Lisp representation of floating point numbers. Anyway, the non-functioning code is in C.lisp. This was the end of my participation in Google Code Jam 2017, because with rank #1850 I didn't make the cut—only the top 1000 in each of the round 1 sub-rounds make it to round 2. Even if I had been successful with the small dataset of C, I wouldn't have made the top 1000. Had I successfully solved the large dataset of B with some time to spare, then it might have worked. It was mostly fun to code these small problems in Lisp. My Lisp skills are getting a bit rusty though. And I'm still not as comfortable with the SBCL/SLIME combination as I am with Allegro Common Lisp and its Emacs interface, but as I had mentioned in previous posts, I wanted to use completely free/open source software. And the awesome Allegro debugger wouldn't have been of much help here anyway. And I love the problems! Kudos to the Googlers who come up with them. How did the other Lispers fare? Badly as far as I can see. There haven't been many Lisp submissions in 2017 anyway, compared with 2016. BBR (Bottleneck Bandwidth and RTT) is a novel congestion control scheme for TCP. It was developed by several Google engineers and has been in use on Google.com and Youtube. See the PERT KB for more background. Here's how you can enable it on a machine running Ubuntu 16.04 LTS "Xenial Xerus". Note: This is mostly useful for systems that send fairly large TCP flows. And the configuration is incompatible with other packet schedulers such as fq_codel, so consider the tradeoff. A reboot should now enable all necessary components: the recent kernel, a pacing-capable packet scheduler, and BBR as the default. You can check whether BBR is actually in effect by using the ss -i command while having at least one TCP connection open—which is already guaranteed to be the case if you are logged in over SSH. The "-i" part of the output mentions "bbr" and includes some BBR-specific metrics as well as the pacing rate applied to each outbound TCP flow. In 2016 I was quite happy with my performance in GCJ, even though I didn't make it past Round 1. So despite being quite busy, I registered for the 2017 edition as well. The Qualification Round happened yesterday. It lasted for 27 hours, starting at 1AM in my time zone. I looked at the puzzles after breakfast, and as usual found them intriguing. I initially skipped the first one (Oversized Pancake Flipper) because I knew it must be easy but I didn't find an obvious approach right away. 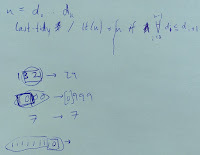 The general approach I took was to first read the problem (out loud if a family member would be willing to listen :-), then think about it while scribbling in a notebook, then when I thought I had an efficient (should be "efficient enough") solution code it up in Lisp more or less top-down. For your amusement, I'm sharing the entirety of my this year's notes, including errors and culs-de-sac. This was definitely the one I had the most (and longest) fun with. It took me several hours (mostly unfocused/doing other things) to get to the breakthrough, which would of course have killed me in a "real" time-limited round. 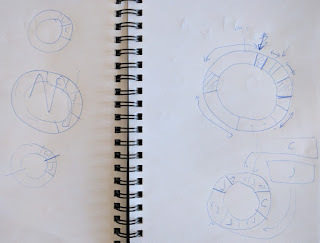 At first I drew up some simple/small examples. 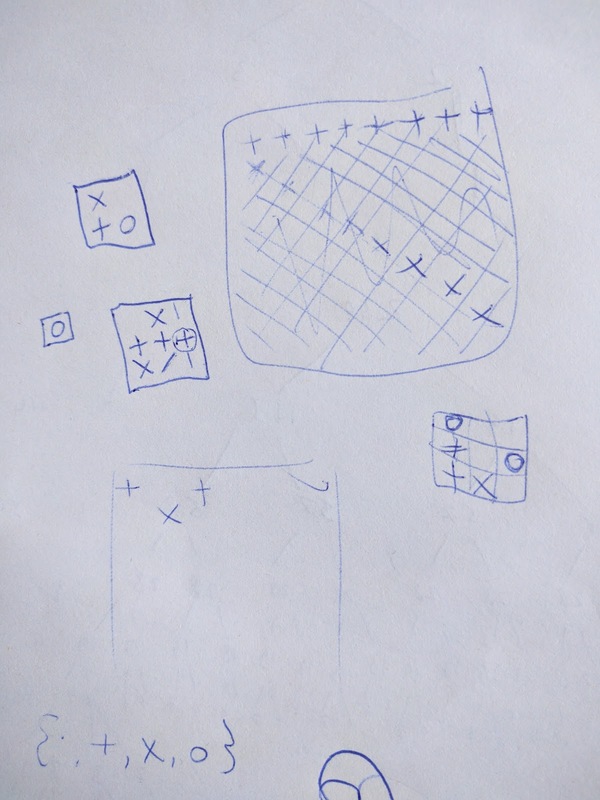 Starting from initial settings with (N=) 7, 6, 5, or 4 spaces, I added all N respective occupants K in order, to get an intuitive picture of how the game plays out. But I didn't find the general pattern. 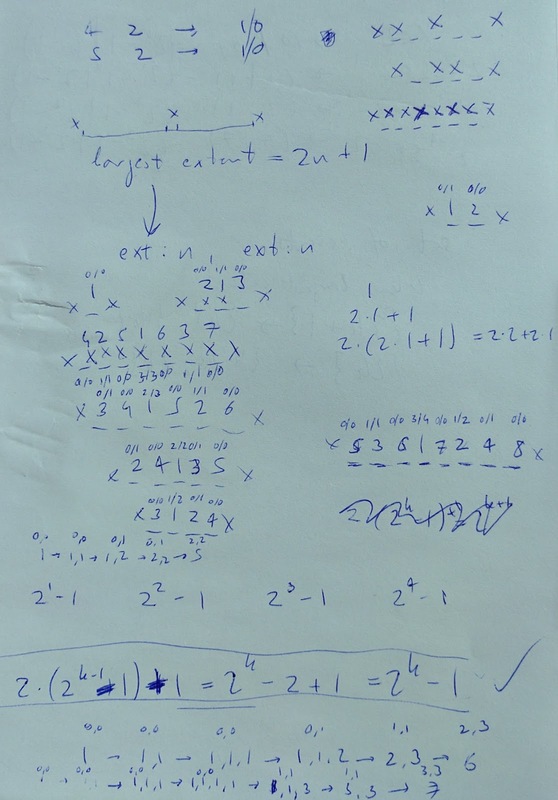 Pretty quickly, I had a complete understanding of the case where N=2i-1: The first person (K=1=20) has 2i-1-1 space to the left and to the right, the next two (21) persons each have 2i-2-1 space to the left and right, and so on. But how to generalize this to Ns that do not have this form? At any "round of the game" (K), there is a set of "extents" of free space. In each round, the largest of the current extents is "split": If the size of this largest extent is odd and larger than one, that is, of the form 2x+1, then it will be split into two extents of size x. That was the "easy" case that covers the problem completely when N=2i-1. But for other kinds of N, I still had no good idea of the pattern how the overall set of extents develops. 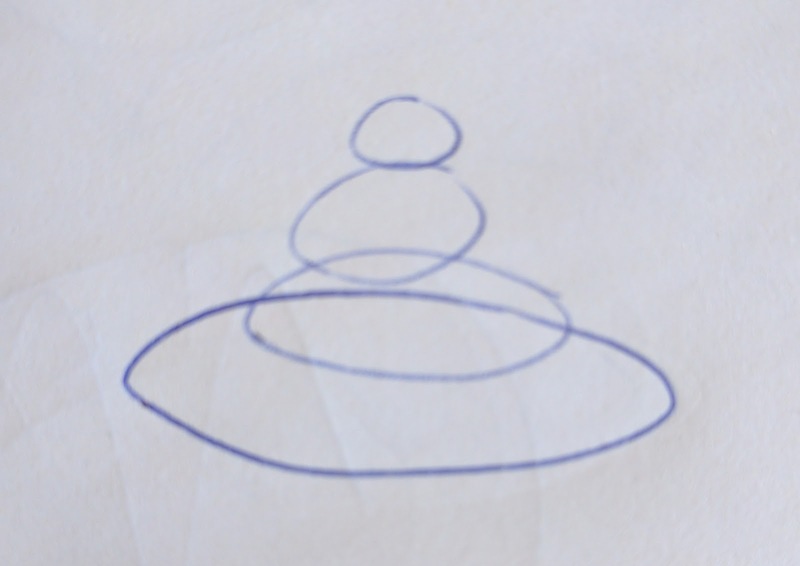 In a desperate attempt, I tried to draw this up as a tree for N=6. That looked somewhat promising, but I still couldn't figure out the general pattern. At least it shows the special case of the size-2 extent, which doesn't really get split into two extents but degenerates into a single size-1 extent. Hm, this seems complicated. 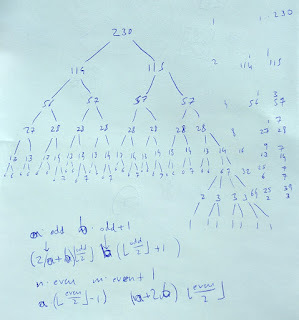 In an even more desperate attempt, I decided that I needed to look at a bigger example and started drawing up the tree for N=230. Nothing very particular about that number, except that I wanted to start with an even number because that seems to be the more complicated case. Now that led to the breakthrough. 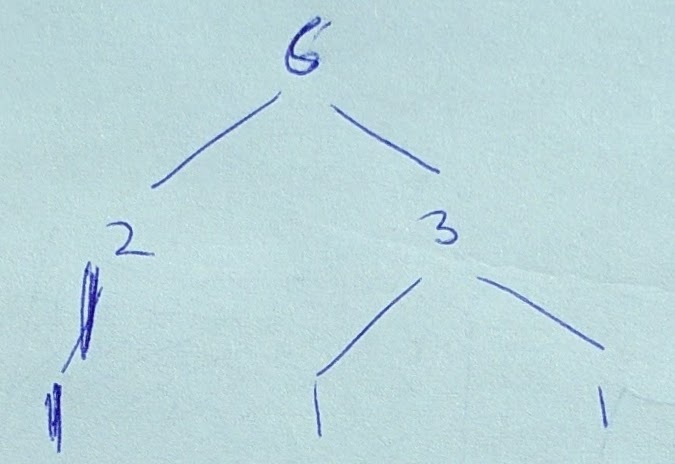 In this non-trivial example, I saw that each level of the tree only contained (a maximum of) two different values with a difference of one. So a complete and useful description of a given level of the tree is the distribution between these two different values. This is what I wrote up in the right-hand column: On level 1 (after the first split) we have extents of 1x114 and 1x115, on level 2, 1x56 and 3x57, on level 3, 1x27 and 7x28, on level 4, 9x13 and 7x14, and so on. Generalizing to level 0, we can say that we start with 1x230 (1xN) and 0x231. But how does one get from level j to level j+1? Well, each odd extent splits into two equal extents, and each even one splits into one that's half the original number and one that's one lower. That leads to the two cases below the large (partially written-out) tree. (I started writing the cases with m and n and then replaced that with a and b, respectively, but didn't do so all the way because I had enough to write the code.) The code is in C.lisp, and I'm quite happy with it. Initially I had switched the even and odd cases, which led to wrong results on the tiny example under the problem description. First I panicked, but by simply running a few examples under (trace minmax-1) I could locate the error. I knew the code was O(log(N)) efficient, so I fed it the small, still-small, and large cases with confidence, and each was processed in less than 10 milliseconds. At this point I was fairly certain to have passed the mark with just two problems done, assuming that at least one of my "large" data set solutions were correct. But it nagged me that I hadn't turned in A, which was supposedly the easiest puzzle. 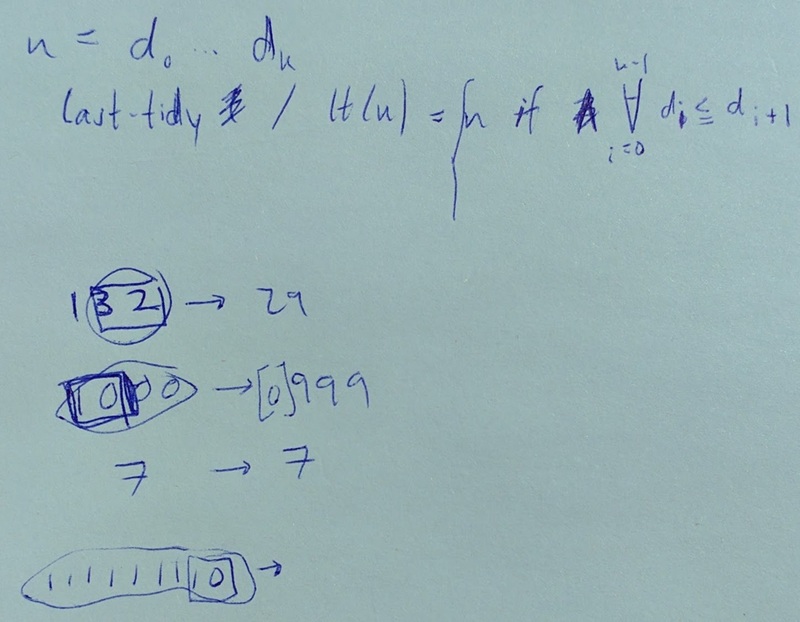 I thought about it again and came up with the following reasoning: The basic operator (multi-pancake flip) is commutative—it doesn't matter whether I flip 4–6 and then 3–5, or the other way round. That means we should be able to strictly process the pancakes in some order, e.g. from left to right. The operator is also an inversion... applying it twice returns the original state and, because of the commutative property, never makes sense. So we can just go to the row of pancakes left-to-right. If the current pancake is –, we turn it and the others to its right. If the current pancake is + we leave it. Then we shift one place to the right and repeat. When we're at the end of the row (which is K places before the end because of the flipper restriction), we're done. The last pancakes must then all be + or we lose. The code is in A.lisp. Again, this is written recursively but destructively: The flipping is done by modifying elements in the vector (string). Probably the code would be more elegant if rewritten using a list instead of a vector, and constructing a fresh list when flipping. When reading the initial state of pancakes, I skipped the reverse (or nreverse) step because it really doesn't matter whether we operate on a mirror image. Wow, that problem sure seemed from a different league. Fewer than 1'000 contestants even got the small solution right, whereas all other problems had at least 13'000 correct solutions. My mental analysis and scribbling didn't get me very far. You cannot have more than one non-+ in the same row or column, not more than one non-x in the same diagonal. If you want to have an o (twice the value of a + or x), then all the other non-empty models in the same row/column need to be +, all on the same diagonal need to be x. There's also a parallel to the N-queens problem, in that in both cases you cannot have more than one "thing" (where thing means "queen" or "non-+/x") per row/column/diagonal. But where N-queens only has one "thing", the queen, in this case the things are different (non-+/non-x), and what's more we need to maximize some value. So I couldn't figure out a useful approach, and the fact that some initial models have been placed makes the reasoning even harder. So I gave up before even trying very hard. The next morning I checked my results for the large data sets and found them all correct. I ranked in the 4'400s, but then I started late. My 65 points would have been sufficient to enter the top 1000 if I had finished everything in 2h15. That would have been somewhat unlikely, even if I had started immediately and had been fully focused. The first sub-round of round 1 will start at 3AM local time, so I'll probably skip it and try 1B a week later, and then probably 1C. Let's see! I didn't have too much trouble with the SLIME/SBCL combination; for more than 25 years I have mostly been using Allegro and its Emacs interface when programming, and this is still much easier for me, especially when debugging. But for the contest I really wanted to use a Free/Open Source Lisp.